There are several things your puppy should know before adulthood, including how to sit, stay, and come on command, how to have a routine for potty breaks throughout the day, how to practice proper doggy etiquette when at a dog park, how not to chew on things that aren’t its own toys, etc., but did you ever think about the even more “no-brainer” things you puppy must know? Although they’re no-brainers, it doesn’t mean they’re not some of the most valuable lessons your puppy should know before it’s an adult!! Here are the top five lessons your puppy should definitely know before it reaches adulthood! 5. 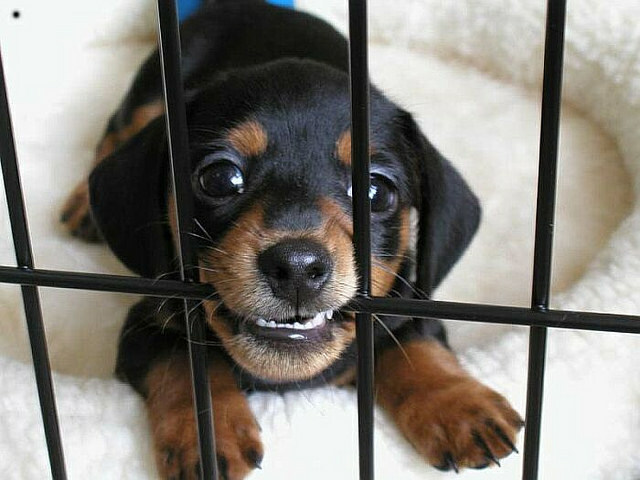 How to be crated/kenneled: Whether you plan to have a crate in your home or not, being able to be caged is an extremely important lesson for every puppy to learn. When your dog is at the vet, at the groomers, or at a dog boarding facility, your dog will be kenneled at some point. It may be for only half an hour after getting bathed, or for days while you’re on vacation. Either way, you dog needs to be able to stay in that kennel without howling, barking, pawing at the walls and door, or throwing itself upon the ground and having a tantrum. No one likes an unhappy dog, so do your puppy a favor and be prepared! While crated, your dog may be left alone, or kept nearby. If your dog is going nuts and having a panic attack because it’s been placed in a crate and sees it as a scary place, it’s still going to have to stay in there until you come and get it. It’s best for your puppy to learn that the crate is not a punishment device, nor is it confinement; it’s a safe and quiet place to be kept safe in. Even if you don’t groom your dog or keep it in boarding while you’re away, a normal dog will be crated at some point while at the vet’s office. Your dog may even have to be kenneled at least once a year, in fact! Once an adult, your dog will need to have its teeth cleaned at least once a year by a veterinarian. This is pretty much a requirement because even if your dog chews teeth-cleaning toys and you brush your dog’s teeth, he still needs to have his teeth and gums checked for disease, infection, plaque, or any other common oral issues almost all dogs have. Your dog will be put under and then have plaque scraped off its teeth and mouth and gums checked for any signs of complications that would otherwise be impossible to check while your wiggly dog’s awake and trying to lick the vet tech’s face rather than stay still with its mouth open. Because this procedure is a yearly thing, teaching your dog to be crated will make the teeth cleaning process much smoother when your dog wakes up in a strange place, half drugged, and in a big metal crate without you around to tell him to chill the heck out. Until the medication wears off and he’s completely awake, he’s going to have to stay in there, and if he spends those hours screaming and howling and peeing all over the place, then so be it. It’s torture for those in the office, your dog, and every client there, so save yourself the embarrassment when you have to pick him up and crate train your puppy early!! 4. How to walk on leash: Similarly to being crated, at some point in your dog’s life, it will have to walk on-leash even if you let your dog out in the yard to exercise or go to the bathroom, and you never bring your dog anything but at the vet. It’s fine if you choose to have a puller when you walk him to the vet, but if your dog ever needs to get his shots or some other reason, he’ll need to be taken to the back room by the vet tech, and this will have to be done with the vet’s own leash. They use a simple “slip lead”, which is essentially a rope that easily loops around a dog’s neck and tightens when pulled so that its a snug fit. If your dog lacks the all leash manners that it should have learned when it was a puppy and not close to as heavy, strong, or stubborn as it is now, your dog can end up strangling itself if it pulls too hard. Your dog can also hurt the vet tech taking it to the back room. No one wants that, right? 3. 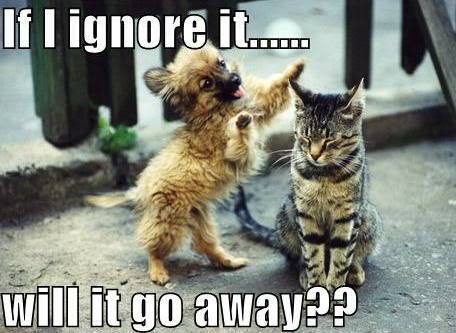 How to ignore strangers: Like the previous two suggestions, this will keep you, your dog, and everyone around you safe! Yes, it’s nice to see your dog interacting nicely with neighbors, other dogs, children, and everyone in the world outside your home, but not everyone wants to be greeted by your dog, even if they loved to be just 6 months ago. As a puppy, he will learn that everyone wants to say hi to his adorable self, but as an adult, people aren’t as eager to pet and hug a big excited full grown dog as much as a tiny fluffy puppy. As your puppy becomes an adult, he may not realize that he’s grown several times in size and strength in just a few months! Why can’t he suddenly can’t run up and say hi to the neighbor’s 3 year old and jump up and lick her face anymore? Rather than get a doggy dictionary to explain it to him, it’s best to start right away not to make your dog magnetized toward every other living being you pass by. It’ll save yourself the trouble and your dog the heartbreak. I’m not saying that you should avoid people who are interested in meeting your puppy, but try hard to not show him off and approach others; have them approach you so that your dog learns that playing with others only happens when they come to you, and you don’t go to them. When someone comes to meet your puppy, be sure to teach him restraint and have him sit and wait before being petted, and prepare beforehand by standing on your dog’s leash so that he won’t be tempted to jump up on people. A puppy jumping up isn’t a big deal unless he’s a giant adult! Wait, is that even possible?! Anyway, all meetings should be calm and casual and not a big deal; that way your dog won’t become obsessed with saying hello to everyone he passes by because it’s a rare occasion that most likely won’t happen during every walk. 2. How to play alone: It’s nice to play with your dog, but when you’re busy writing a extremely lengthy essay on what to teach your puppy before adulthood, it’s even nicer when you don’t need to! Teaching your puppy that he doesn’t have to have a playmate to enjoy his toys is extremely important, especially when you’re away at work or are in the middle of doing something else in general. Giving your puppy safe chew toys that he can occupy himself with when you’re not available to play is the easiest way to teach your puppy independence and patience. When your puppy begs for attention to play while you’re busy, simply provide him with an alternative: A durable, safe, and fun one-player toy! Kong toys with frozen peanut butter smudged inside, Nylabones of the proper size and strength, Mighty Dog toys, and StarMarks chew toys are good suggestions of things you can bring out before you leave your puppy alone. Be sure that all toys you leave out for your puppy is safe and strong enough to play with without you needing to keep a sharp eye on him. Don’t leave soft stuffed toys, rope toys, or any other toys out you know you’ll have to supervise him with unless you’re in the same room and want to promote two-player play with them. Patience is important to teach, so if he has something to play with but still demands your attention, you’re sadly going to have to ignore him, no matter how adorable he is. Be sure that when you ignore him, it’s 100%! Don’t even glance down at him because acknowledgement is often considered a reward, especially when your puppy begs. When he gives up trying to force you to join in his game and goes to play with his toy himself, THEN you can reward him with praise and sometimes even a treat that you stick inside the toy (is possible). Playing with toys alone should still be fun! 1. How to do… Nothing! Teaching your puppy how to do nothing is, in my opinion, the most important thing you can teach him. Many adult dogs don’t, and probably never will, know how to do nothing — mostly because owners don’t realize that this can be taught! You’re walking your dog and reach a stop light, or need to fix your shoe, or need to step aside and let someone pass by on the sidewalk; what do you want your dog to do? You want him to stop, stay beside you, and do nothing. You don’t want him to lunge into the street, whine and tug at the leash, or leap up and say hi to the passerby. You’ve brought your dog with you while you plan to have brunch outside a restaurant; the weather is great, your dog is leashed beside you, other people are enjoying their meals nearby. You want your dog to stay beside you, attached to the table, and enjoy being outside in the fresh air and do nothing; you don’t want him crying and barking, begging for food, zig-zagging through the chairs, jumping up onto tables, or getting under tables and licking peoples’ feet. You want him to stay still, without telling him to sit and stay and wait and wait and wait and wait and… You get my point. As a puppy, he will learn that every few hours, he’s gonna need to go out for a walk, and then play, and then be fed, and then play, and then be trained, and then be cuddled with, and then everything else a busy puppy does all day. A puppy’s routine is full of attention and excitement and tasks. It’s very different from how it will become when it’s a mature (hah, yeah right!) adult who has time to smell the roses and, well, do nothing. But! This dog needs to learn that it’s possible to do nothing rather than smell the roses and lick the owner’s hand and bark at the neighbor dog and go nuts. You need to teach your puppy how to relax. You need to teach your puppy how to stop and stay still during walks. You need to teach your puppy that even though we’re outside and there are distractions on every corner, you don’t have to do anything; you can do nothing. Every day, for about 10 mins, sit down with your puppy in an empty area– no toys– and listen to music (or it can be silent if you don’t mind it). Don’t cuddle with him, don’t pet him, don’t give him treats, don’t do anything. Just sit down and relax. He can lie beside you and cuddle, but don’t touch him. Maybe read a book, or play with your phone, or whatever — Just ignore him, unless he starts going nuts, then you can give him a chew toy to occupy him. After the 10 mins go by, reward him and continue on with your busy day. You can teach him “Relax” before you two have your session of nothing if you like. As he gets older, you can do this for longer if you feel the need to. When walking, teach your dog to relax for a few seconds. Stop walking, stand there, and chill out. 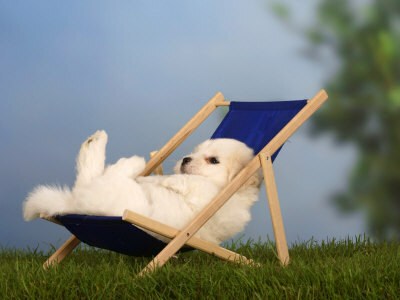 As your puppy becomes more advanced in doing nothing, practice relaxing while waiting at the cross walk, or while at a park with your dog tied to your chair/bench at a shopping center. You can put a jacket of some sort on your puppy/dog to indicate that you’re in training mode so that people don’t interrupt. Be sure to keep your dog social and expose him to many different things so that the environment isn’t so alarming or so amazing that it’s impossible to chill out. That’s kind of a given though, right? Well, I hope these Words of Wisdom were valuable to you, and that you can mold your puppy into a mature adult with these simple, but very important, tasks! As for those who have adult dogs, how many of these important things has he accomplished? Even as an adult, your dog can still learn these important lessons. Although they may seem like things that are unimportant in your lifestyle right now, eventually your dog will be challenged and things that seemed as petty as walking on-leash will be something you will be glad you taught him when he was young! Categories: dog, puppy, Safety, training | Tags: animal, dog, lesson, puppy, teach, train, training | Permalink. Should I Shave My Pet For the Summer? Knows Sit on Happy New Year 2015! vimore on Happy New Year 2015!